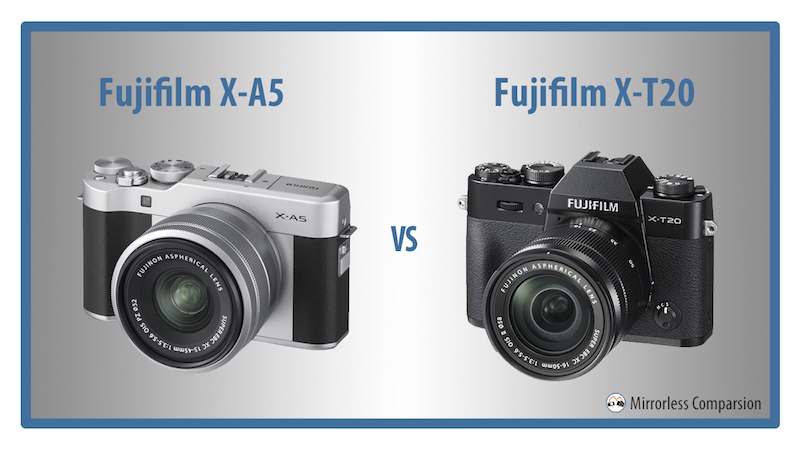 At the top of the entry level range of Fujifilm cameras is the X-A5. It is characterised by its flat-topped design and Bayer sensor and is the camera beginners are most likely to go for thanks to its reasonable price tag. 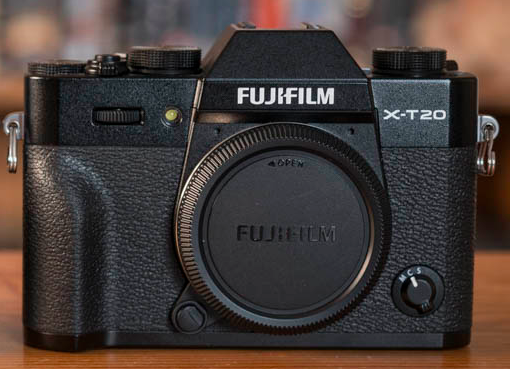 Sitting one step above is the X-T20, a mid-range model with a few more bells and whistles than the X-A5 but an equally compact body and attractive design. 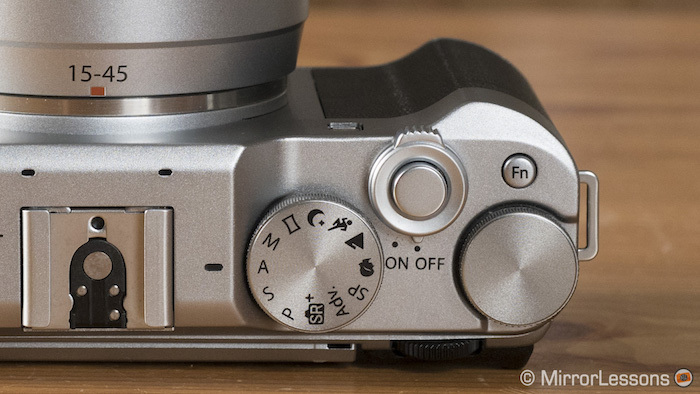 However, unlike the X-A5, it comes with a built-in viewfinder and an X-Trans III sensor. Of course, the differences between the two cameras don’t end there, which is why we’ve decided to detail them all in the following comparison preview and hopefully help you figure out which is most suitable for your photographic needs. Let’s begin! Housed inside both cameras is an APS-C sized CMOS sensor with approximately 24MP. While the X-T20 uses the same X-Trans III sensor as the X-T2, X-Pro and X-H1, the X-A5 is furnished with a standard Bayer type sensor just like the other X-A models and the new X-T100. What X-Trans means is that the sensor has a pattern of photosites that guarantees the presence of at least one red, blue and green pixel on every horizontal and vertical line. In addition to minimising moire effects, it also increases sharpness thanks to the lack of a low-pass filter and is supposed to reproduce more accurate colours. 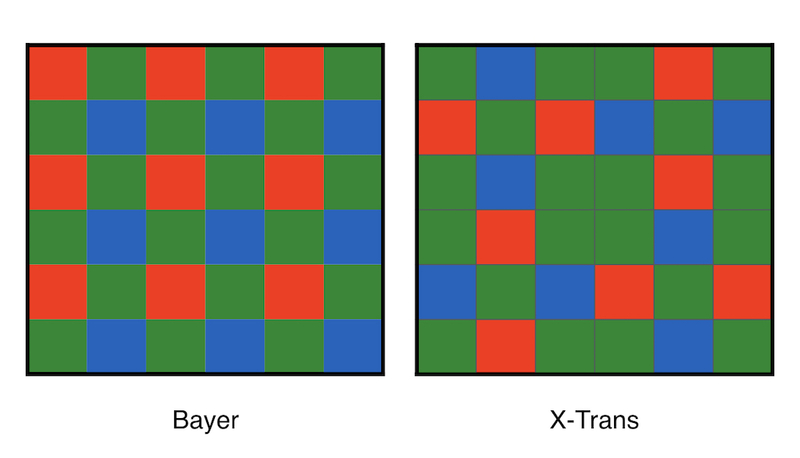 The “X-Trans versus Bayer” debate is a complex one so we’re not going to delve into it here but it suffices to say that some photographers adore the look of X-Trans, whereas others prefer the Bayer array. It is also worth noting that some image processors, such as Iridient Developer, deal with X-Trans files better than others such as Adobe Lightroom. The X-T20 is clearly a member of the X-T family as demonstrated by its SLR-like design. In fact, it looks very much like a miniature version of the X-T2. The body is wrapped in a black faux leather covering and the top and bottom magnesium alloy plates come in two colour variations: black and silver. 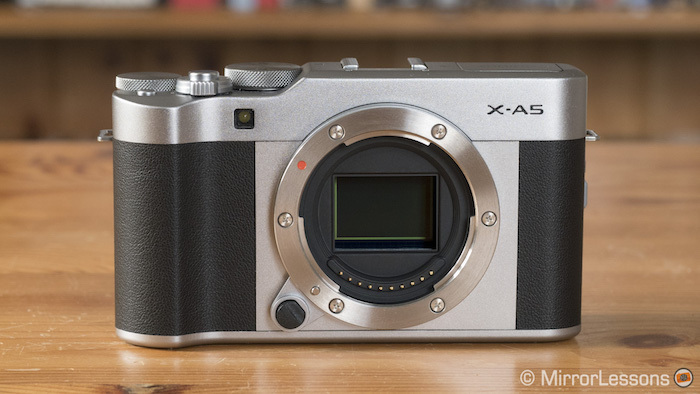 By contrast, the X-A5 has the look of a flat-topped rangefinder camera. It is mostly made of plastic and the faux leather covering comes in three colours: black, pink or brown. The X-T20 is marginally larger and heavier than the X-A5 but you won’t notice a tangible difference when using them out in the field. On the top plate, you’ll notice that the X-A5 comes with a simpler array of dials including a PSAM dial, control dial, and on/off switch. Because the X-T20 targets a slightly more advanced user base, it is complete with a more complex array of dials including one for shutter speed, exposure compensation and drive/bracketing modes. There are twin dials on the front and rear to change the exposure, as well as a focus lever on the front. Both feature a two-way articulating LCD on the rear with 1040K dots of resolution. One of the biggest differences between the X-A5 and X-T20 is that the latter has a built-in OLED electronic viewfinder located at the centre of the body. It is a 0.39-inch type with a 2,360K dots, 100% coverage, 0.62x magnification and an eye point of 17.5mm. 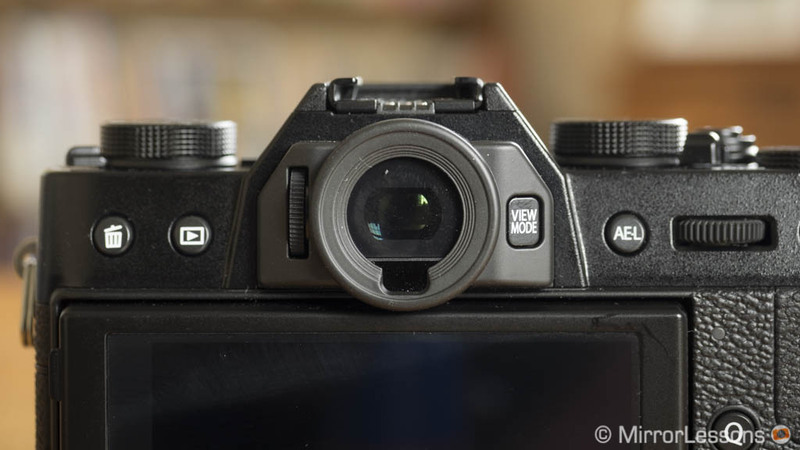 Unfortunately Fujifilm hasn’t released an external viewfinder for the X-Series, so before you take the leap, have a good think about how important a viewfinder is to your shooting experience. The specifications alone are enough to tell you that the X-T20 has an edge when it comes to continuous shooting speeds. The maximum speed with the mechanical shutter is a very decent 8fps while activating the electronic shutter will raise the speed to 14fps. If you don’t want to end up with a deluge of images, there are also three slower options: 5fps, 4fps and 3fps. On the X-A5, there are just two speeds: 6fps and 3fps. As for the buffer depth, the X-T20 is once again more capable. For example, you can fire off 42 JPG frames or 23 RAW files in a burst at 14fps, whereas the X-A5 can only take an average of 10 JPG frames at 6fps. Of course, speed is also dependant on the card you’re using and how many bursts you fired off previously. On paper, the X-A5 and X-T20 utilise a similar intelligent hybrid autofocus system. The X-A5 has 91 areas on a 13×7 grid while on the X-T20, you can increase the points to 325 on a 25×13 grid in certain focus modes. In all honesty, the autofocus performance of the X-A5 didn’t really impress us during our testing period, especially when paired with the kit zoom. The X-T20, on the other hand, performs in a very similar manner to the X-T2 and has since received some software updates via firmware to additionally improve the performance. 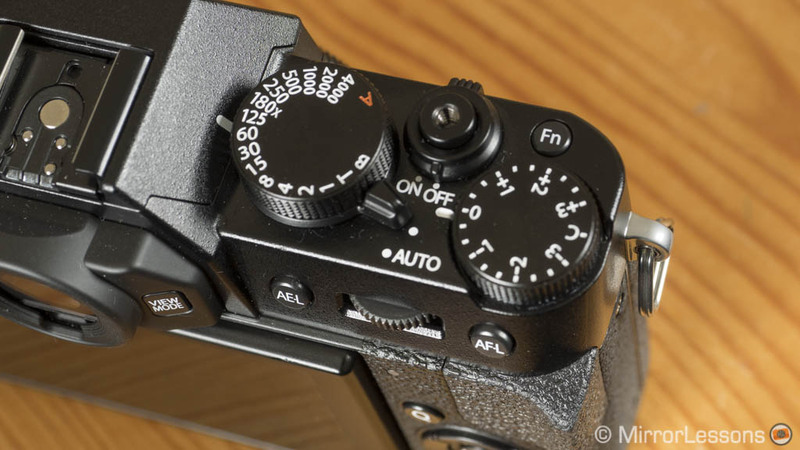 A feature the X-A5 lacks is the AF-C custom settings, which have been designed to tailor the AF system to specific shooting situations on the X-T20. For example, there is an option called Set 3 which informs the camera that you are shooting subjects that rapidly accelerate or decelerate. Both cameras have 4K video capabilities but the X-T20 has a distinct advantage in that its maximum frame rate is 30fps. The X-A5 is limited to just 15fps, which isn’t practical for anything except amateur filming. In Full HD, both cameras have a maximum frame rate of 60fps. Another area where the X-T20 has a small advantage is the maximum recording duration. In 4K, the X-A5 is capped at just 5 minutes whereas the X-T20 can record for as long as 10 minutes. In Full HD, this goes up to 15 minutes on the X-T20 or 14 minutes on the X-A5. The X-A5 has one trick up its sleeve and that’s the High Speed movie mode. As the name suggests, it lets you record HD video up to quad speed for slow motion clips. Both cameras come with a 2.5mm 3-pole mini jack for external microphones. 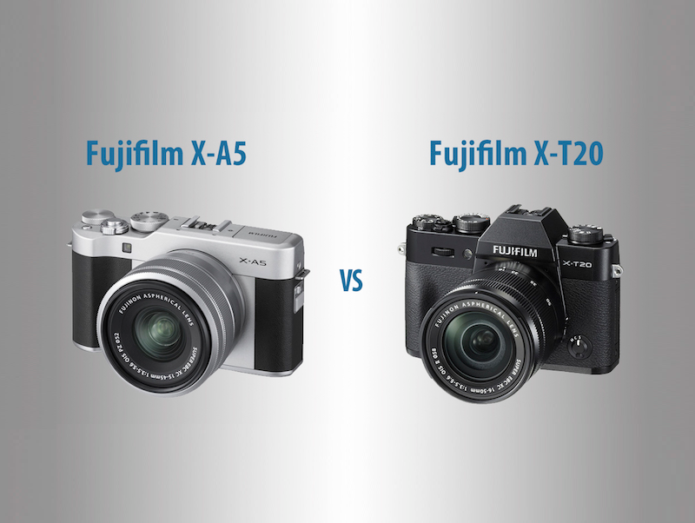 Both the X-A5 and X-T20 come with a good range of extra features such as timelapse, face and eye detection, advanced filters, multiple exposure and bracketing. There are a few features each model retains for itself however. First we have the two new 4K still features – 4K Burst and Multi Focus – which are only found on the X-A5 and the recently announced X-T100. The former lets you extract stills from footage taken in 4K at 15fps, whereas the latter allows you stack a series of 4K stills taken at different focus distances. You can also take a 4K timelapse at 15fps. I wouldn’t be surprised if these features come via firmware update to the X-T20 at some point however. The X-A5 also has more self-timer options such as Smile, Buddy, Group, and Face Auto Shutter. 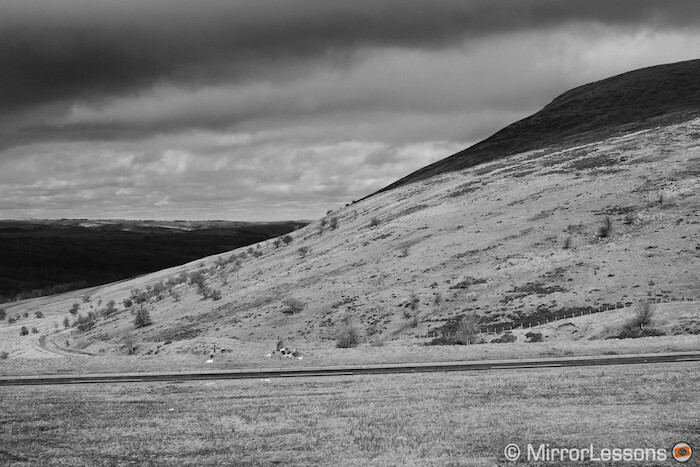 Only the X-T20 has a 14-bit RAW option and the black and white ACROS film simulation mode to which you can apply a yellow/green/red filter or a grain effect. The two cameras both come with a built-in pop-up flash but they are found in different locations on the body. The X-A5’s is located on the left-hand side of the top plate whereas the X-T20’s is found on top of the viewfinder. The X-T20 also has a higher guide number of 7 at ISO 100 versus 4 on the X-A5. Most modern mirrorless cameras come with Bluetooth connectivity, so it’s no surprise that it accompanies WiFi as an option on the X-A5. Bluetooth differs from WiFi in that it maintains a constant low-power connection between the camera and smart device and can be used to record the location data. The X-T20 only has WiFi connectivity because it is an older model. Next we come to the battery life of the two cameras. Even though they use the same NP126S battery, the X-A5 has a significantly longer battery life – probably because it requires less power to operate than the X-T20. For instance, the maximum number of shots you can take on one charge is 450 shots, whereas the X-T20 can only manage 350. If you film lots of video clips in 4K or take a series of successive bursts, you can expect the battery life to drain more rapidly with either model. There is one final difference worth talking about and that is of course the price. The addition of the built-in viewfinder is the main reason the X-T20 is approximately $300 more expensive than the X-A5 when bought with the kit lens. For the types of subjects I like to shoot, I would personally have difficulty using a camera that lacks a viewfinder but you might feel differently especially if you’re used to using your screen for smartphone photography. Other features that contribute to the X-T20’s higher price tag are the X-Trans III sensor, better video specifications – namely the ability to record at 30fps – faster continuous shooting speeds and better overall build quality. For these reasons, I feel that the X-T20 is the better bang for the buck. However, if you are mostly interested in day-to-day photography such as photographing friends or your travels, the X-A5 is a more than capable tool for the job.